It's rare that a top-ten list--or more precisely, a bottom-ten list--leads to philosophical questions. But that's exactly what happened when my editor asked me to write about the worst video games ever. As I started to think about particularly atrocious games I'd played over the past quarter-century or so, I realized that each one was bad for an entirely different set of reasons. So what, precisely, makes a game terrible? 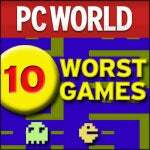 To help answer that vital question, I turned to the game fans at PC World, as well as to my family and friends, and even a few enemies. They responded with multiple answers, as well as scads of nominees for our list of the all-time worst. Some titles had rotten game play. Some were a waste of considerable potential. Others led you to question the very reason for their existence, or at least what their creators were smoking. The worst of the worst managed to fit into two or more of these categories. I ranked the ten worst games using a complex, highly scientific series of factors, looking for lousy playability, crude aesthetics, executive or developer cluelessness, half-baked concepts, and overall negative impact on humanity; I also considered how many unprintable comments I received about a particular title. Hold your nose: Here comes the number one stinker.